The decision by Cadbury's new owner Kraft to continue with the closure of the Somerdale factory in Keynsham has prompted dismay among workers. Employees called the decision "utterly despicable" and said they had been deceived by Kraft. Before its takeover of Cadbury, Kraft had indicated it would keep the factory in Keynsham open. But on Tuesday it said earlier plans by Cadbury to close the plant and move production to Poland were too advanced. Speaking to the BBC before its successful bid, the head of Kraft's operations in the UK, Nick Bunker, said he hoped to see production continue at the Somerdale factory. "We believe we would be in a position to keep the Somerdale plant operating and we are sincere about that," he told the BBC, repeating a claim made in Kraft's official bid proposal. Business Secretary Lord Mandelson said Kraft's global chief executive, Irene Rosenfeld, had not given specific commitments on jobs when they met last week, but said she should have made the position clear. "A week ago she would have known what announcement would be made, barely six days later. "It would have been more honest if it had been more straight forward and straight dealing with the company and the workforce and also with the government if she had told me what their intentions were." Cadbury employee Amoree Radford said she was shocked that those earlier commitments had been abandoned. "I believed Kraft totally," she said. "But they made a fool of me. They are utterly despicable." Jennie Formby from the Unite union accused Kraft of "a cruel manipulation", calling the earlier commitments to the Keynsham factory "a cynical ploy". 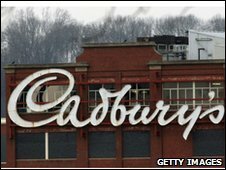 Plans to close the Keynsham plant, at the cost of 400 jobs, were announced by Cadbury in 2007. Kraft said it had only become aware of how advanced plans for the new Poland factory were after the takeover deal had been agreed. The hostile nature of the bid, they argued, made it difficult to access information about Cadbury's relocation plans, which were now too far advanced to reverse. However, Professor David Bailey from Coventry University Business School questioned this explanation. "Kraft spent a huge amount of money on researching this bid," he said. "They should have known full well what was going on inside Cadbury and that plans for production in Poland were very advanced. "I only had access to public accounts and market research reports but it was clear to me that the assurances given about keeping open that plant were simply not credible." Unite's Jennie Formby said Kraft's "dishonesty" was a concern for the future relationship between the company and Cadbury workers. Cadbury employs 4,500 people in the UK, including 2,500 at its historic Bournville factory in Birmingham and around 400 at its head offices in Uxbridge. It has yet to announce plans for these other sites, but has already said it expects the takeover to result in "significant cost savings".